These useful frames are perfect for the Christmas classroom, and many of them are designed to look good pinned to the board or strung for effect. Some are lined for writing tasks, some are blank so that younger children can draw or add lettering. Most can be coloured in. Here's a large Christmas ornament frame for Christmas writing and drawing activities. Colour them and hang them up with ribbon for a pretty Christmas display! This pretty Christmas tree frame comes in colour and black and white, lined or blank, so it is perfect for brightening up the classroom and home during the festive season and can be used for all sorts of writing and drawing projects. At Christmas we all wish for peace on earth, and this frame makes a lovely classroom writing project. Ask the children to write down their wish for peace before cutting out the doves and "flying" them around the room by tying to a line or pinning to the board. This hat frame is instantly recognisable as belonging to a certain Father Christmas! It makes a fun classroom writing or drawing frame and looks great on display. The kids could stick on some cotton wool, too, perhaps? Use this stocking writing frame to write or draw about the Christmas stocking - either some creative writing, or perhaps an explanation of where and how the tradition started. This is a fun Christmas printable for the classroom or home. 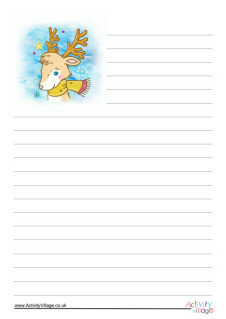 Ask the children to image what might be in the Christmas stocking, writing or drawing in their suggestions.